"One of my favorite recipes! The combination of paprika and mustard powder really offsets the sweetness of the orange juice. I tend to eyeball when cooking, so if you cook more breasts or use a large pan, make extra sauce to baste with. I'll frequently use extra glaze when baking just so there's plenty to pour over rice once it's done!" Whisk orange juice, vegetable oil, orange zest, paprika, mustard, and salt in a bowl. Arrange chicken breast halves in a baking dish; pour orange juice mixture over chicken. 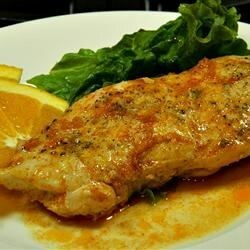 Bake chicken breasts until no longer pink in the center and juices run clear, 30 to 45 minutes, basting with orange glaze every 10 to 15 minutes. An instant-read thermometer inserted into the center should read at least 165 degrees F (74 degrees C). Great and easy recipe. I switched mustard with cumin but still game out great! Very good meal to make in the week or ahead of time to heat up during the week. I made this tonight and my family liked it, however i think the 1/2 cup of oil is a little excessive.. I cooked this in my pressure cooker then baked it for 15 minutes at 400 for a crispy edge.